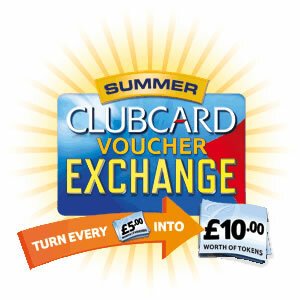 The summer clubcard big voucher exchange is now open! Exchange your clubcard vouchers and double the value. For every £5 worth of clubcard vouchers you will receive a £10 token to spend at selected Tesco departments both in-store and online. This year Tesco you can exchange your vouchers in the following 10 departments. A huge range means you will definitely find something, a perfect treat for you and the family this summer. Visit the www.tesco.com Tesco Voucher Exchange 2012 website for full details. Take a browse through the 10 departments and simply choose where you’d like to spend your vouchers. Please note once you’ve exchanged your vouchers you’ll only be able to spend them in your selected department. To be eligible all vouchers must be exchanged by June 14th, so get exchanging today! 0 Responses to "Tesco kicks off its summer clubcard voucher exchange"